Turns out the Goody Hair accessories have an off-label use. 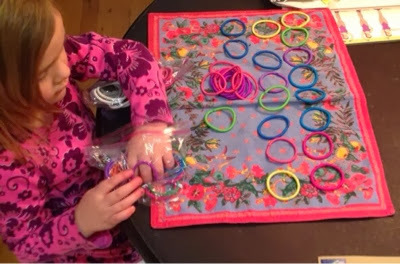 My Brooklyn granddaughter loves to sort and organize small objects - small plastic monkeys, bears, beads, or (who knew) hair elastics! I sent these in a flowered shipping envelope I bought at the post office, but, according to my granddaughter, the flowers meant the package was for her not her mother. With 120 items, I thought the hair accessories would be shared. Now, I'm wondering if my daughter will get any.